I have been working on the new website for admittedly WAY too long before feeling comfortable enough to release it. I initially bought my domain name, myroadtopt.com, this March. I bought a theme from a website, attempted to edit it for about a month, and was struggling with a lot of the coding and design because the theme that I bought had a lot of flaws. Then I realized that I was spending too much time on my blog and not enough time on studying for my spring semester, so I just studied for 3-4 weeks and didn’t make any progress on my blog. I then started completely over with a free theme, and have been editing and customizing that theme for the past 2 months. I’ve also been focusing on my clinical affiliations, moving a few times, and focusing on my professional and personal development. The website is not 100% what I want it to look like still and I doubt that it’ll ever look exactly how I want it to, but that shouldn’t one of my top priorities anyways. One of my newest goals is to be more aware of my perfectionism and work towards prioritizing my to-do lists. I’ve always been a perfectionist, but it’s become more and more of a hindrance than a positive influence on my life. I have been realizing more often that I tend to focus too much on things that don’t matter, and have been somewhat ignoring things that matter much more. With that being said, I’m looking forward to focusing on writing and updating my blog consistently, and worrying less about what it looks like. 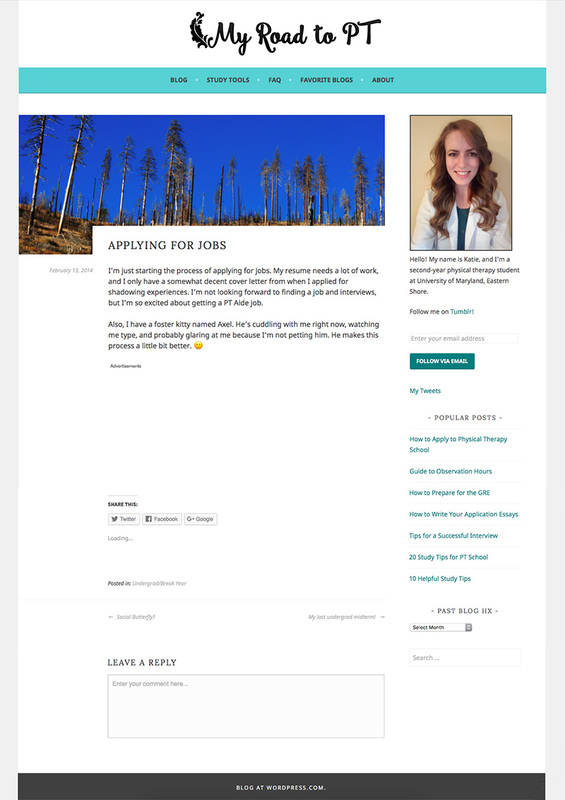 If you’re curious about what my old blogs have looked like, keep on reading! 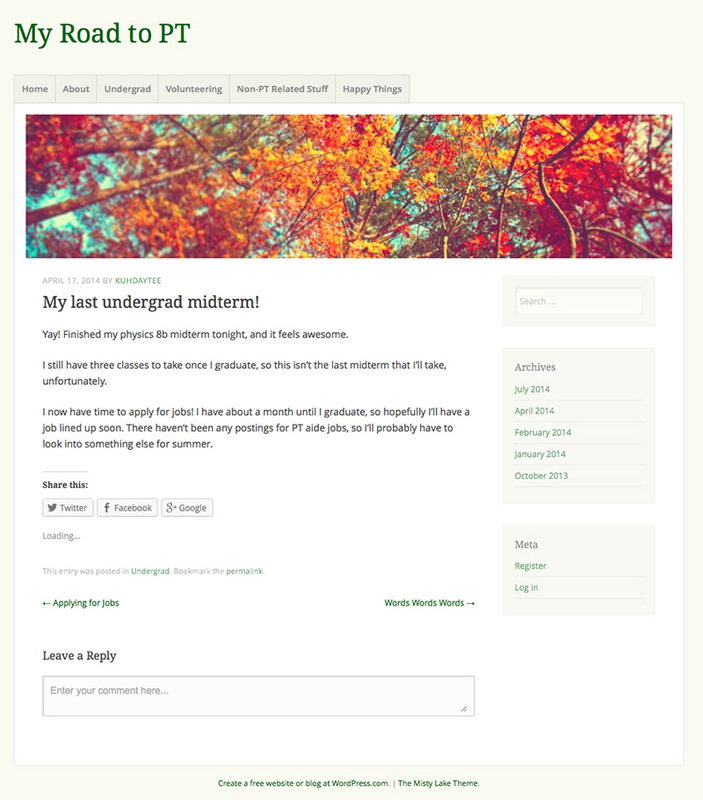 This was my first theme when I began blogging in 2013. I stole that autumn photo from Google images, and didn’t really include many of my own photos into my website. At this point in time, most of my views were just from myself. I’m not entirely sure what image I used in the header, but I’m guessing that I found another photo from Google Images. The part underneath my photo that reads “I begin the Doctorate of Physical Therapy Program at University of Maryland, Eastern Shore” gave me chills. It feels so weird that I’m about to graduate in 2 months. I took that photo in the header! I finally started to add more of my photos into my blog, which is one of the best choices I think I’ve made so far. That photo was taken during my first semester of PT school. I used this theme for a LONG time. I loved that each post was able to include a photo that I have taken because it made my blog feel a lot more personal. I also made that header using two different fonts, and continue to use the same image today! 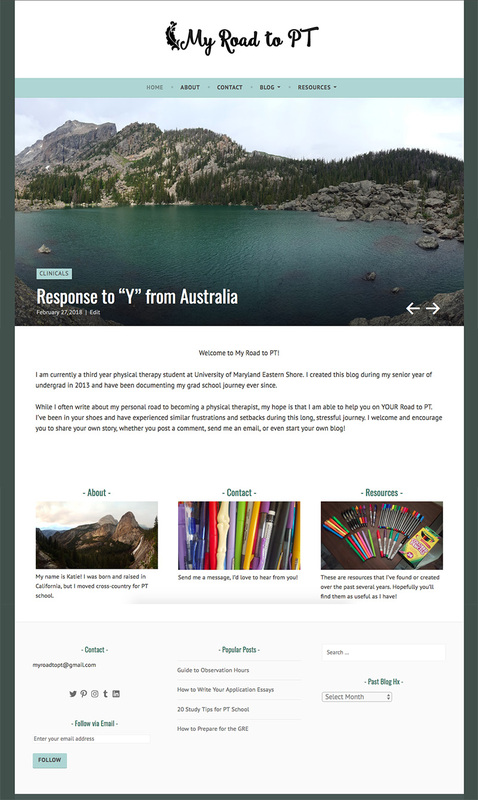 This is the last theme that I had on my old domain name, myroadtopt.wordpress.com. 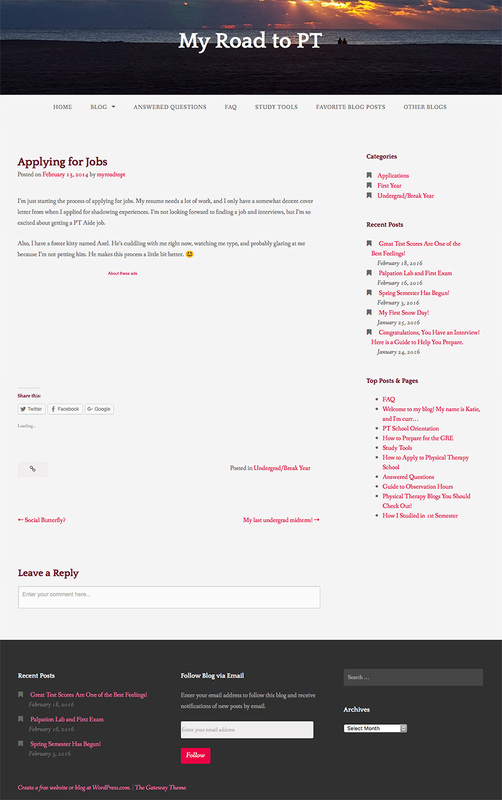 I used to think that the slider of featured blog posts at the top was super fancy. Which theme was your favorite? Comment below! Next Next post: Are You Eager to Become More Successful? Take This Short Assessment! I’ve also struggled with trying to perfectly update my website, and also recently changed it. Your website looks great (as always) and I’m excited to continue reading! Thank you!!! 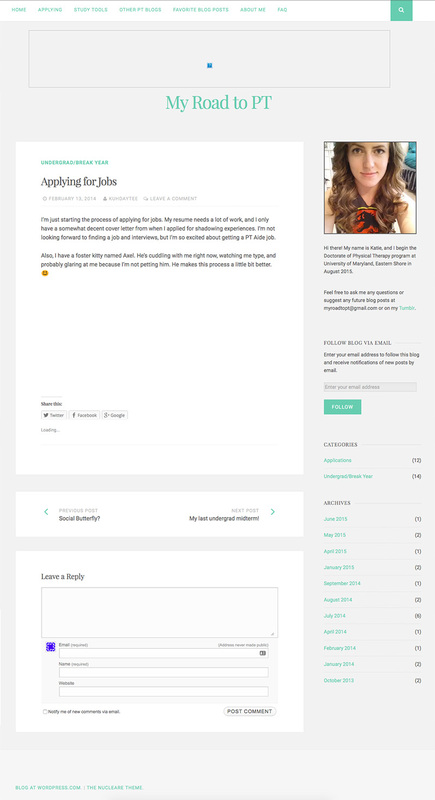 <3 I noticed your blog update too - it looks so great! I'm looking forward to writing again. I've missed it so much.